We are into flashlights, and those available today are simply amazing in what they can do using LED technology. This post is about three of the best we have found. 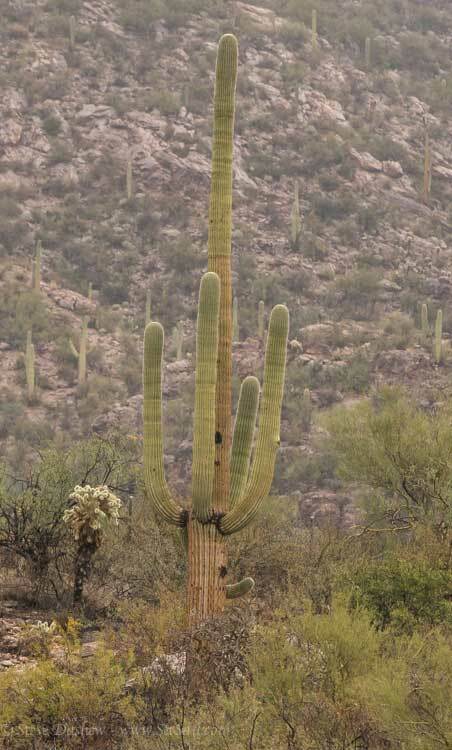 Here is a comparison illumination of a sahuaro cactus 90 meters/300 feet away from our office window. These are three separate photos of the same scene spliced together. The center photo illuminated by a Marinebeam flashlight, which we first read about on Ben Ellison’s Panbo website, is by far the most illuminating light we have ever held. 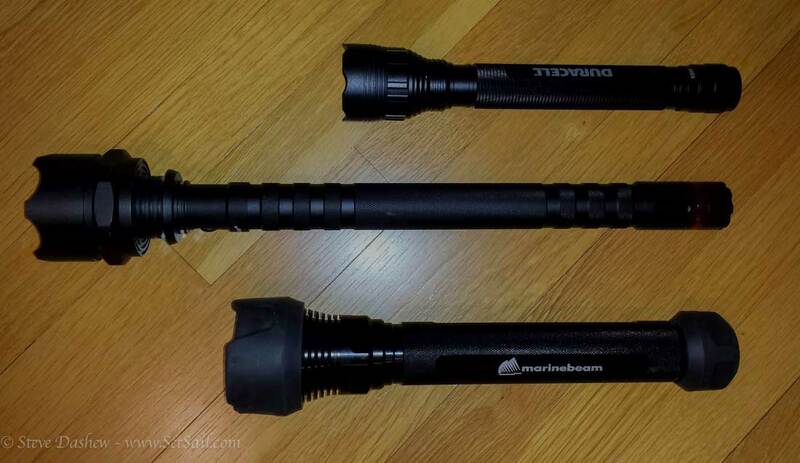 The Marinebeam has a lens which concentrates the light, and the result is nothing short of astonishing. At US $129 we think it is a bargain, and will have one for sure when we next go cruising. 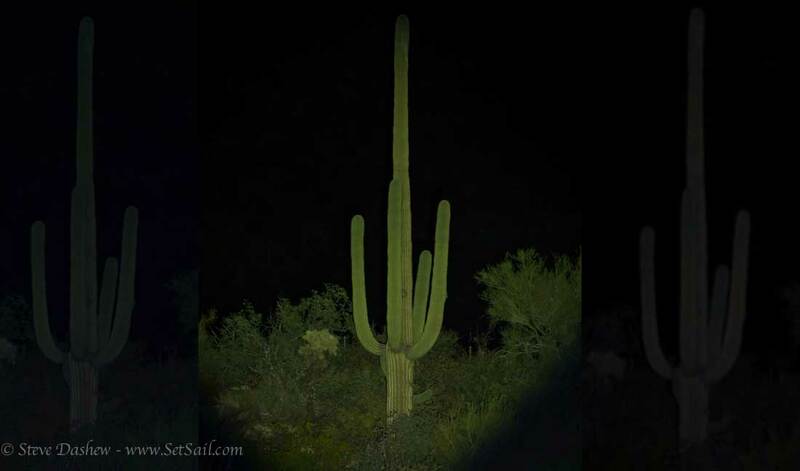 The left photo is lit with an 1100 lumen Lifeguard flashlight acquired from Amazon, the previous champion (now available rated 1500 lumens) for about US $70. We used to think this was bright. The right side is a Duracell light with an adjustable lens, rated at 1000 lumens. It is a touch weaker at this distance. However, when you adjust the lens from spot to wide angle it does a wonderful job in close. These photos are meant to show relative strength. The actual lighting of the area looked a little stronger to the naked eye. To put this into context this is a wider angle photo in daylight. 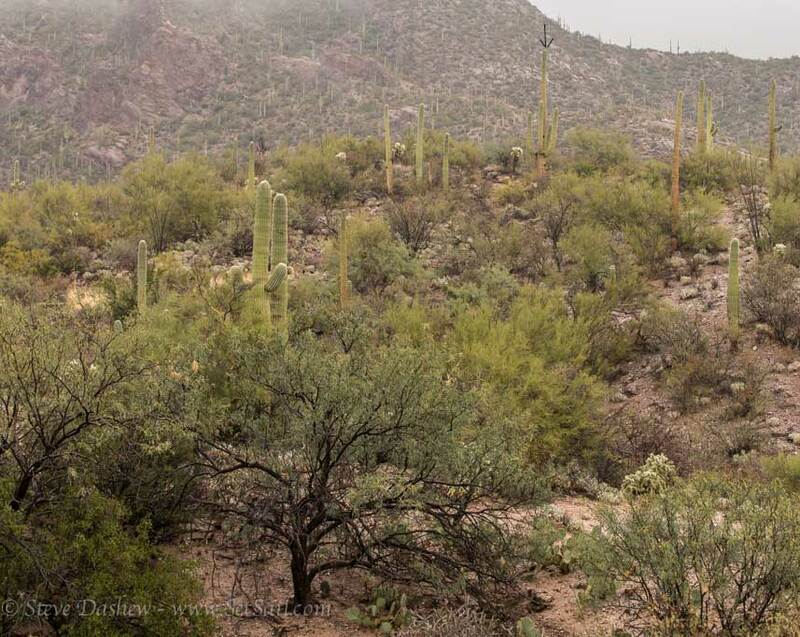 The sahuaro in the preceding photo is in the middle, top of the photo, with a black arrow pointing downward. A long way off. A daylight shot at the same focal length above. What is your best entrant in the ultimate flashlight contest? For the photographers out in SetSail land, the nighttime shots were with a Canon 70-200 F 2.8 lens, a 1DX body, Iso 1600, F2.8 at 1/13th of a second, tripod mounted. This entry was posted on Monday, February 23rd, 2015 at 7:09 am and is filed under Dashew Logs, four, The Logs. Both comments and pings are currently closed. I have a MarineBeam, and it’s truly amazing for long distance spotlight-type work. But it’s not useful for doing anything ON or near the boat – too bright and too narrow! For those tasks my current favorite is the Nitecore P12. 1000 lumens, fits in the palm of your hand. Cree LED. Nice beam pattern – bright center with good light around it. Four power levels from night light to blazing, along with strobe, SOS, and locator beacon settings. Uses two CR123 batteries or one rechargeable 18650. Easy to use interface – on/off on the tail of the flashlight, side switch controls the light setting. Just bought another one. Hi Steve, for some years I´ve been addicted to headlights. It frees up both arms. The latest I bought is intended for biking in the dark an produces from 800 to 1600 (dual beam) lumens. Perfect for checking anchor hold in the middle of the night. Any brand info would be appreciated. Sounds great for the dinghy too in some conditions. As Nils mentioned there are some truly phenomenal Mt. biking units out there on the market in terms of light production. I have lesser needs so my personal favorites are the black diamond line designed for mountaineering. I use the lighter storm version (the lack of the battery pack on the back is easier for lying in a tent and reading but this one throws more light if that is the goal. Most of these units are equipped with red lights and strobe function as well. You also can’t go too wrong with the Petzl product at this end of the market. REI stocks a wide selection. On a totally different topic, when are we going see the performance numbers on 97-1? We are wading through 13 gigabytes of data. Hope to have something to present in the next few days. The brandname is “Magicshine” my model is a single-beam called MJ-808 giving 900 lumens for at least three hours on a single charge. As I said the also make more powerful models but I find that to much light can be a problem up close. We have an Olight SR95S UT Intimidator SBT-70 LED flashlight. It has 3 intensities, 1,250 lm good for 3 continuous hours, 500 lm good for 8 hours and 150lm good for 48 hours. It is rechargeable, comes in its own case with a charger and it WORKS. Overall length is 12.5″, the handle is just under 2″ and the head is 3 1/2″ in diameter. We found our lights in the past were pretty much useless at sea. It was like shining into a black hole with no reflection. This light is unbelievable. It can turn buildings far in the distance white. Last year roughly half way between Iceland and Greenland we lit up a single berg on radar. We hadn’t seen another berg so far and didn’t see another until closing the Greenland coast and those were relatively near-shore. We changed course to keep the mark 1nm off to port and slowed to 3-4 knots or so with my wife on the bow with the light. Our concern was trailing ice. In the end the flashlight turned bergy bits white at over 1/2nm. No other light or spotlight we owned would have even come close. This light was a gift that came from http://www.longhorntactical.com so I can’t give the price but I’m sure it is toward the upper end. Really love the fact that it’s powered by D cells. Do you use or have a preference for rechargeables on the boat, and if so, which ones? We have just been using use and toss batteries for the flashlights. As a professional marine engineer,I put my torch through hell and back on daily basis. I highly recommend the Lenser Frogman unit, its been dropped in oil water, dropped from height, suffered extremes of heat and cold and of course underwater. I really wish you a good experience with rechargeable batteries and flashlights. The energy to weight ratio is good, and with the right selection of components, it all works very well and reliably. Can tell you from what I have tried, some are given away or stay in the drawer, while others are being used all the time. for their general quality and user interface. If in need of a flashlight with integrated USB charger, the Nitecore MHxx series works well. Steve, I’d like to shine some light onto the Streamlight Stinger line of products. While I have to agree (firsthand), that the Lifeguard 1100 puts out a very respectable (astonishing really) amount of light, and is pretty efficient, I have to say it’s a little on the cumbersome side because of it’s physical size. It’s also aggressive on finished surfaces, one must pay attention to where it’s stored and used. It’s a great compromise of both close-range worklight, and 60m spotlight, but there are the considerations that should be observed. I also have to agree (firsthand) that the MarineBeam appears to have no equal in long range spotting. I am in agreement with Jim (above) however, that using it as a worklight is somewhat fruitless. I do appreciate that it’s a manageable size, and all of the impact points are wrapped in a very sturdy rubber. I know that my two year old “first-mate” cant hurt himself with it, as opposed to the Lifeguard. But it has a very specific purpose, there isn’t much middle ground. Now, while the Streamlight cant compare total lumen output to either the LifeGuard, or the MarineBeam, it’s almost always my first choice for tasks less than 30 meters in range. It’s only about 23cm long, and has a 4cm diameter head, and a 3cm diameter grip. The package that I purchase came with the light, two Li-Ion 3.6VDC rechargeable batteries, a captive cradle capable of charging both of the batteries at the same time (one inside the flashlight), a 120VAC-12VDC “wall-wort” (transformer style) plug (others available), and a 12VDC “cigarette lighter” style plug as well. I can’t count the number of wet bilges that it’s been dropped into (IPX4), nor can I count the number of times that its been dropped from 1.25m above the ground. It’s becoming very popular in the law enforcement community, and as a result has a whole host of accessories are available for it as well. It’s redefined my expectations of a flashlight, and carries a lifetime warranty. It may not be the “end all, be all”, but it should definitely get some serious consideration for the tool box and the nightstand.